WILLEMSTAD, CARACAS - Venezuelan state oil company PDVSA on Thursday said on Friday it was negotiating the continuation of its lease of Curaçao’s Isla refinery but was open to Chinese partners following a preliminary deal between the island and China’s Guangdong Zhenrong Energy to operate the complex. PDVSA has for decades operated the refinery, which opened in 1918, under a lease agreement. But the cash-poor company has been reluctant to invest some $1.5 billion that Curaçao authorities requested several years back to modernize the 335,000 barrels-per-day facility. China’s Guangdong Zhenrong Energy Co, a commodity trader with strong backing from Beijing, signed a binding framework pact with Curaçao’s government in November. If the deal goes ahead, the Chinese firm would replace PDVSA as operator of Isla, tightening its grip on Venezuela’s oil industry. PDVSA has said its lease, which expires in 2019, is not up for renegotiation, but on Friday appeared to open the door to partnering with China. “There is a big business potential for an alliance with Chinese partners or any world-class investor to operate this infrastructure,” PDVSA said in the statement, adding it was “advancing” in negotiations to continue its lease on the refinery. 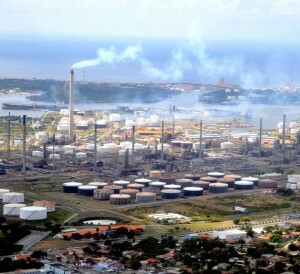 Refinery Vice President Guillermo Blanco was in Curaçao meeting with the island’s prime minister, Eugene Rhuggenaath, PDVSA said in a statement.